In San Angelo Texas a dog, named Buddy, rode on the small side step of an ambulance for 20 miles just to stay with his owner. 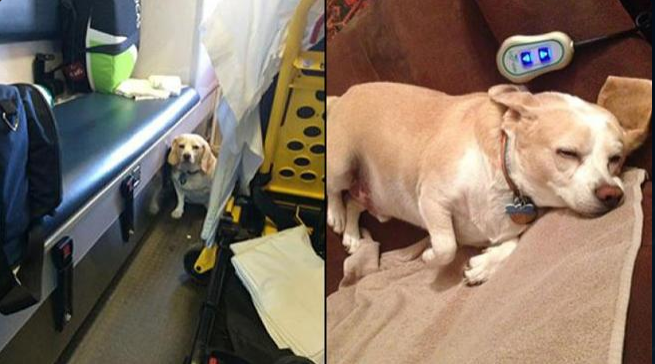 The beagle mix jumped onto the outside of the ambulance as it picked up his owner to take him to the emergency room. The paramedics did not know the dog was there until another driver flagged him down. By the time Buddy was discovered by the ambulance driver the paramedics had no choice but to load the dog into the back and take him on the remainder of the almost hour long trip. Buddy’s owner, 85 year old JR Nicholson, had adopted the dog four months ago. He called for an ambulance because he felt dizzy and was soon released from the hospital. It was a good thing that someone saw the little guy so he didn’t ride outside the ambulance for an hour. Such a loyal dog!